In many ways, the Angels are the Red Sox opposite. The lineup is brittle and heavily dependent upon one very good player. The rotation is…complete. The one possible standout is on the disabled list until late April. The bullpen has been a problem for years. While all of baseball has recruited hard-throwing relief aces, the Angels have zagged with perhaps the softest throwing bullpen in the league. Weaver is turning into a right-handed Jamie Moyer. His fastball runs in the mid-80s, yet he continues to post strong results. Part of the success is a high infield fly rate. Those free outs are always handy. His fastball is more effective than those of many fireballers. His five pitch repertoire keeps hitters off balance, and he mixes in three above average breaking balls. There are uses for Weaver, but I'd rather let my rivals manage the unusual profile. Nobody saw Shoemaker coming. He was nothing prior to 2014. He wasn't even much of anything while in the minors (6.31 ERA). Upon promotion, he got his act together to post a 3.04 ERA with 8.21 K/9 and 1.59 BB/9. He throws five pitches, but it's his splitter and slider that take the cake. There are two scenarios we should consider. In one, Shoemaker maintains an excellent walk rate and establishes himself as a reliable fantasy asset. In the other, his walk rate increases to around 3.00 BB/9, and he turns in a 4.00 ERA. He's the 53rd pitcher off the board, so it's not like you have to pay a lot to discover which Shoemaker you've purchased. Richards will miss most of April with a knee injury. When he returns, we'll quickly learn if he maintained the skills that led to his breakout 2014. He's always wielded a blistering fastball. He supplements his 97 mph heat with a sinker, a plus-plus slider, and an infrequent curve. In 168.2 innings, he posted a 2.61 ERA with 8.75 K/9 and 2.72 BB/9. If his stuff is down just a tick, I worry that the league will quickly adjust. He's a great injury stash, but don't be afraid to let a rival buy high. The Angels acquired Andrew Heaney and Nicholas Tropeano over the offseason. Both pitchers figure to be reliable major league hurlers. Last season, they debuted for the Marlins and Astros, respectively. Tropeano was slightly better in the small sample. They could become fantasy regulars, but they look like waiver wire streaming options for 2015. Street barely scrapes 90 mph with his fastball, but he consistently produces good seasons. Last year, he posted a 1.37 ERA with 8.65 K/9 and 2.12 BB/9. His repertoire includes the slow fastball, an above average changeup, and a plus slider. Apparently, it's enough to induce weak contact. He's a fly ball pitcher, so there is some downside to the overall profile. In 2013, he allowed 12 home runs in 56 innings. Lucky for him, there were few base runners. Smith snagged a few saves last year after Ernesto Frieri lost the job. He's good enough to close in that he's reliable. However, he's not a very high ceiling pitcher. He also induces weak contact with a sub-90 mph fastball. He mostly just let's hitters roll over his sinker, although he'll also mix in an average slider. 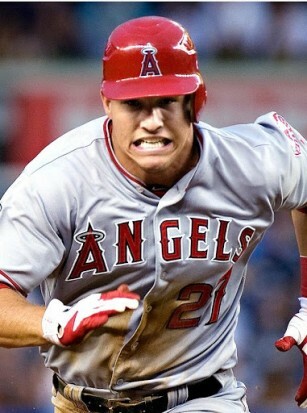 Is it necessary to discuss Mike Trout? I guess we can question whether he's more valuable than Clayton Kershaw. Pitchers tend to carry a 25 to 30 percent chance to land on the disabled list. They're also more prone to major injuries than position players. In certain unique league structures, Kershaw may be the top player. For most standard leagues, you want to stick with Trout. Last season, Kole Calhoun settled in as the Angels' leadoff man. He's not a prototypical table setter. His on base skills are roughly league average, but he makes up for it with above average power. In fact, “average" can be used to describe most facets of his game. He makes average contact, walks and strikes out at an average rate, has average speed, and shows average plate discipline. The best part of his game is that he reaches base ahead of Trout. A healthy season is also a 100 run season. As the 25th outfielder, he's not cheap. With Howie Kendrick out of the picture, shortstop Erick Aybar could play a prominent role in the offense. When Calhoun is out, he'll bat leadoff. Otherwise, he'll probably hit fifth or sixth. That might seem like a weird place for a high contact, low power shortstop (and it is). It's a symptom of the Trout heavy lineup. Aybar is available after pick 200 and should provide modest five category production. Think something like 70/7/70/14/.275. The case for Pujols is mixed. His fly ball distance is in multi-year decline. He averaged just 274 feet per fly last season, which ranks him with such luminaries as Derek Jeter and Chris Heisey. However, this was also the first offseason since he arrived in Los Angeles that he could undertake a normal training regimen. Pujols will hit third for the Angels, and there are very few alternatives if he scuffles. I expect strong overall production, although the home run total could be disappointing. Those on the lookout for sleepers should give C.J. Cron a sniff. The 25-year-old should settle in as the regular designated hitter, and he's available after pick 300. He hit .256/.289/.450 in his debut without any platoon split. Based on the available data, expect similar numbers this year. He'll bat fourth or fifth most days, so he'll reap RBI. Others who could factor in the middle of the lineup include Matt Joyce and David Freese. Joyce is a left-handed platoon bat. His power declined last season, so there's room for pessimism. Freese has earned the injury prone label. He tends to be banged up almost all of the time. Hyperbole aside, he's a low ceiling third baseman. Role is still important. You don't want to let a part-time cleanup hitter sit on the waiver wire. The Angels are the third team in our power rankings. The club is extremely reliant on Mike Trout. If he were to miss a season, it would be hard for the Angels to even contend. Outside of the Big Fish, the lineup is overwhelming mediocre. It's a fine group of players, but there's very little dynamism. The rotation is solid. It's not pretty, nobody will drool over it, but it should be better than average. The same holds true for the bullpen. It might be the softest throwing relief corps, headlined by one of the softest throwing closer and setup tandems. If I were to build a roster around Mike Trout, I'd be doing it completely differently.